Thanks to everyone who helped and who took part in this first Christmas venture which exceeded our expectations by a substantial margin - between 150-200 people thoroughly enjoyed themselves, sang well - well accompanied by superb musicians, and then refreshed themselves with tea, coffee, hot chocolate, cakes and mince pies provided by the Ariel Scouts. We are encouraged to do it all again next year. 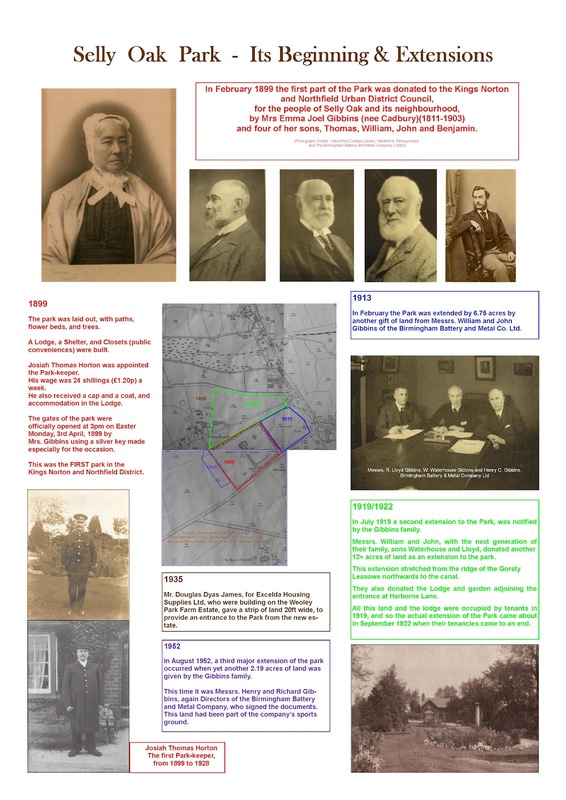 Look out for new notices being posted. More about this board coming soon. 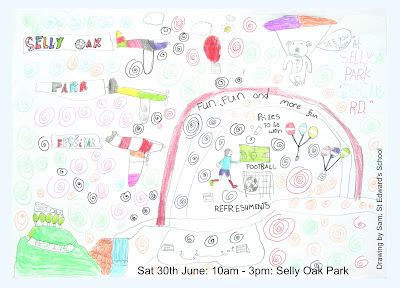 Take your bat and ball and have a go - while the sun is shining! Committee Members (approx 7 meetings per year plus help at festival). Leaflet delivery (can you deliver 2 leaflets a year to your street). Festival Stewards (no training required). which will also be open on the day. There will be an opportunity for budding artistes to show their skills and entertain visitors at the Festival. If you, individually, or in a group, are interested in performing then why not contact us now to discuss this opportunity. 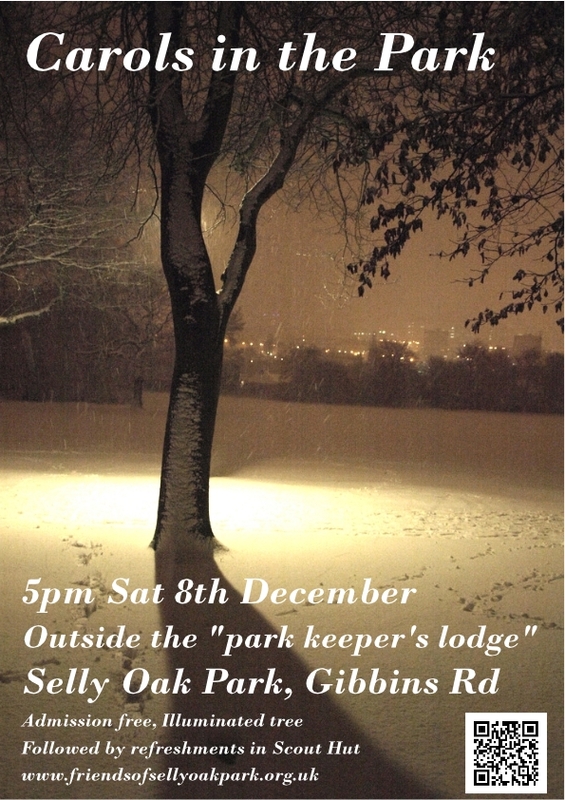 Similarly if you want to hold a stall then reserve your space now. Don't miss a great fun day and a great opportunity. 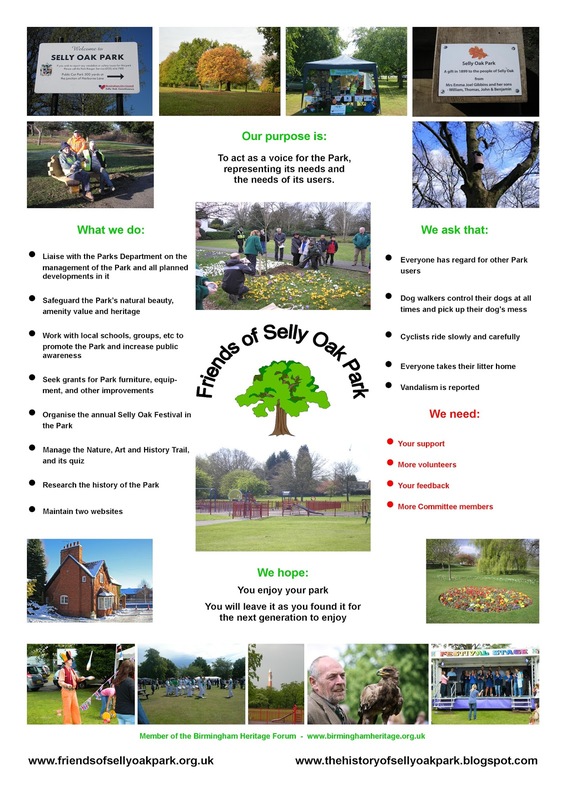 The Friends of Selly Oak Park have joined the Birmingham Heritage Forum. The Forum is a consortium of prestigious heritage sites in and around Birmingham and it has kindly accepted the Park on the grounds of its historical interest - being i) the first park in the area of the former Kings Norton and Northfield Urban District Council opened in 1899, and ii) the last resting place of the stump of the famous Selly Oak oak tree, and having iii) a Nature, Art and Heritage Trail, and iv) a detailed account of its history. Beside all of that, the park is an attractive place in a busy part of the city to while away an hour in an open, airy green space - a lunch hour or a relaxing hour after work. We are pleased to announce the installation of a new bench dedicated to the memory of founder member of the Friends of Selly Oak Park, Geoff Bartlett. 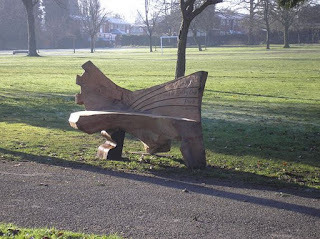 The bench was carved by local wood carver Graham Jones who has two other carvings in the park.